Thrifty and Frugal Living: Free Cone Day at Ben & Jerry's Tomorrow 03/23! Free Cone Day at Ben & Jerry's Tomorrow 03/23! I am so sad that they took away our Ben & Jerry's! Now I would have to drive about an hour to go to one. 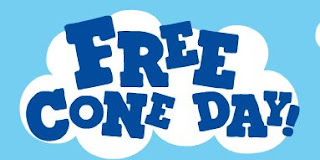 Anyhow, tomorrow (03/23/10) is free cone day (12-8pm)! Go here for details. You can put your zip code into the store finder to see if your Ben & Jerry's participates.